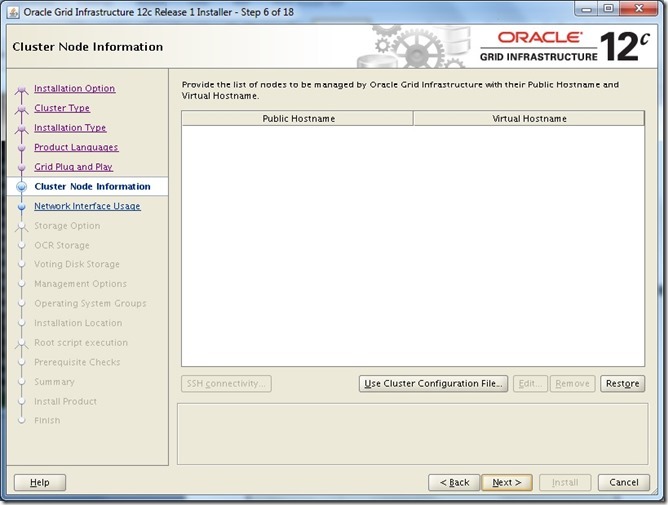 Easy to configure and manage ODCS in BI Publisher on Oracle Public Cloud. No port or firewall issues. ODCS offers a scalable, robust and secure document storage solution on cloud. Bursting documents to multiple customers at the same time. 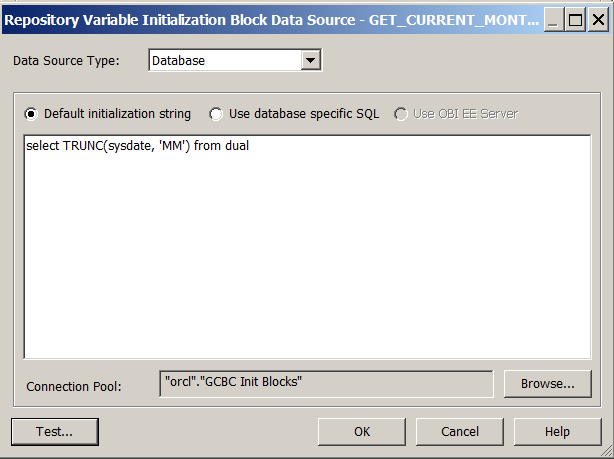 How to Configure ODCS in BI Publisher? Configuration of ODCS in BI Publisher requires the URI, username and password. Here the username is expected to have access to the folder where the files are to be delivered. How to Schedule and Deliver to ODCS? Delivery to ODCS can be managed through both - a Normal Scheduled Job and a Bursting Job. Once the documents are delivered to ODCS, they can be accessed by user based on his access to the folder, very similar to FTP or WebDAV access. That's all for now. Stay tuned for more updates ! These two topics may seem unrelated; however, the ransomware attacks over the last few days provide us with a reminder of what people can do with known vulnerabilities in an operating system. Organisations consider upgrades a necessary evil; they cost money, take up time and often have little tangible benefit or return on investment (ROI). In the case of upgrades between major version of software, for example, moving from OBIEE 10g to 12c there are significant architecture, security, functional and user interface changes that may justify the upgrade alone, but they are unlikely to significantly change the way an organisation operates and may introduce new components and management processes which produce an additional overhead. There is another reason to perform upgrades: to keep your operating systems compliant with corporate security standards. OBIEE, and most other enterprise software products, come with certification matrices that detail the supported operating system for each product. The older the version of OBIEE, the older the supported operating systems are, and this is where the problem starts. If we take an example of an organisation running OBIEE 10g, the most recent certified version of Windows it can run is Windows 2008 R2, which will fall outside of your company's security policy. You will be less likely to be patching the operating system on the server as it will either have fallen off the radar or Microsoft may have stopped releasing patches for that version of the operating system. The result leaves a system that has access to critical enterprise data vulnerable to known attacks. The only answer is to upgrade, but how do we justify ROI and obtain budget? I think we need to recognise that there is a cost of ownership associated with maintaining systems, the benefit of which is the mitigation of the risk of an instance like the ransomware attacks. It is highly unlikely that anyone could have predicted those attacks, so you could never have used it as a reason to justify an upgrade. However, these things do happen, and a significant amount of cyber attacks probably go on undetected. The best protection you have is to make sure your systems are up to date. In this post we're looking at map quality. On the left a JPG map, to the right an SVG output. If we ignore the fact that they have different levels of features or layers. Imagine getting the maps into a PDF and then printing them. Its pretty clear that the SVG version of the map is going to render better on paper compared to JPG. If you specify SVG_URL, a URL to an SVG Basic image stored on the MapViewer host system is returned. If you specify SVGZ_URL, a URL to an SVG Compressed image stored on the MapViewer host system is returned. SVG Compressed format can effectively reduce the size of the SVG map by 40 to 70 percent compared with SVG Basic format, thus providing better performance. First, before I get into a great week of Higher Education Data Warehousing and analytics discussions, I want to thank the HEDW board and their membership. They embraced us with open arms in our first year of conference sponsorship. Our longtime friend and HEDW board member, Phyllis Wykoff, from Miami University of Ohio even spent some time with us behind the booth! HEDW was in the lovely desert scape of Tucson, AZ at the University of Arizona. Sunday was a fantastic day of training, followed by three days of outstanding presentations from member institutions and sponsors. Rittman Mead wanted to show how important the higher education community is to us, so along with me, we had our CEO-Jon Mead, our CTO-Jordan Meyer, and our US Managing Director-Charles Elliott. If our AirBnB had ears, it would have heard several solutions to the problems of the world as well as discussions of the fleeting athleticism of days gone past. But alas, that will have to wait. While at the conference, we had a multitude of great conversations with member institutions and there were a few themes that stuck out to us with regard to common issues and questions from our higher education friends. I will talk a little bit about each one below with some context on how Rittman Mead is the right fit to be partners in addressing some big questions out there. One theme that was evident from hour one was the influx of Tableau in the higher education community. Rittman Mead is known for being the leader in the Oracle Business Intelligence thought and consulting space and we very much love the OBIEE community. With that said, we have, like all BI practitioners, seen the rapid rise of Tableau within departments and lately as an enterprise solution. It would be silly for the OBIEE community to close their eyes and pretend that it isn’t happening. 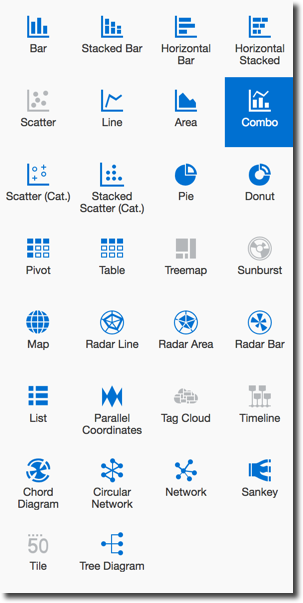 There are great capabilities coming out of Oracle with Data Visualization but the fact is, people have been buying Tableau for a few years and Tableau footprints exist within organizations. This is a challenge that isn't going away. We had a ton of conversations about how to include newer technologies in institutions’ business intelligence and data warehousing footprints. There is clearly a desire to see how big data technologies like Hadoop, data science topics like the R statistical modeling language, and messaging services like Kafka could positively impact higher education organizations. Understanding how you may eliminate batch loads, predict student success, know if potential financial aid is not being used, know more about your students with analysis of student transactions with machine learning, and store more data with distributed architectures like Hadoop are all situations that are readily solvable. Rittman Mead can help you prioritize what will make the biggest value impact with a Modernization Assessment. We work with organizations to make good plans for implementation of modern technology at the right place and at the right time. If you want more info, please let us know. Members of HEDW need a different view or another set of eyes sometimes and the feedback we heard is that consulting services like ours can seem out of reach with budgets tighter than ever. That is why we recently announced the Rittman Mead Expert Service Desk. Each month, there are hours available to spend however you would like with Rittman Mead’s experts. Do you have a mini project that never seems to get done? Do you need help with a value proposition for a project or upgrade? Did production just go down and you can’t seem to figure it out? With Expert Service desk, you have the full Rittman Mead support model at your fingertips. Let us know if you might want a little help from your friends at Rittman Mead. Things are a changing and sometimes it is tough to keep up with all of the moving parts. Rittman Mead is proud to be a champion of sharing new approaches and technologies to our communities. Spending time this week with our higher education friends is proof more that our time spent sharing is well worth it. There are great possibilities out there and we look forward to sharing them throughout the year and at HEDW 2018 in Oregon! Three days of Oracle’s Modern Finance Experience set my personal new record for “Most Consecutive Days Wearing a Suit.” Surrounded by finance professionals (mostly CFOs, VPs of FP&A, and people who make money from Finance execs), I came prepared to learn nothing… yet found myself quoting the content for days to come. The event featured top notch speakers on cutting edge concepts: the opening keynote with Mark Hurd, a panel on the changing world of finance with Matt Bradley & Rondy Ng, Hari Sankar on Hybrid in the world of Oracle EPM, and even one of my competitors (more on that in a second). For those of you who couldn’t be there (or didn’t want to pay a lot of money to dress up for three days), I thought I’d share my top five quotes as best as I could transcribe them. Mark Hurd was pulling double duty: he gave the opening keynote at Oracle HCM World (held at a nearby hotel) and then bolted over to Oracle Modern Finance Experience to deliver our keynote. He primarily talked Oracle strategy for the next few years which – to badly paraphrase The Graduate – can be summed up in one word: Cloud. He gave a compelling argument for why the Cloud is right for Oracle and businesses (though server vendors and hosting providers should be terrified). Now let me be clear: much of this conference was focused around the Cloud, so many of these quotes will be too, but what I liked about Mark’s presentation was it gave clear, concise, and practically irrefutable arguments of the benefits of the Cloud. The reason I liked the quote above is it answers the concerns from all those IT departments: what happens to my job if I don’t spend 80% of our resources on maintaining existing systems? You’ll get to spend your time on actually improving systems. Increased innovation, greater security, better compliance … the things you’ve been wanting to get to but never have time or budget to address. I went to a session on the hybrid world of Oracle EPM. I knew Hari would be introducing a customer who had both on-premises Hyperion applications and Cloud applications. What I didn’t know is that he would be addressing the future of Oracle EPM on-premises. 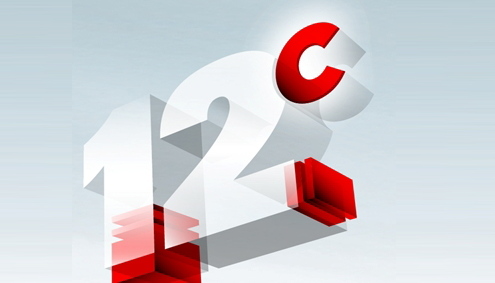 As most of you know, the current version for the on-premises Oracle EPM products is 11.1.2.4.x. What many of you do not know is that Oracle has taken future major versions (11.1.2.5 and 12c) of those products off the roadmap. Or to put it another way: Hyperion Planning and other Hyperion product users who want impressive new features? Go to the Cloud because they’re probably never coming to on-premises. To quote Hari once more, “create a 1-3 year roadmap for moving to a Cloud environment” or find your applications increasingly obsolete. There was an entertaining Oracle panel led by Jeff Jacoby (Master Principal Sales Consultant and a really nice guy no matter what his family says) that included Rondy Ng (he’s over ERP development), Matt Bradley (he’s over EPM development), and Michael Gobbo (also a lofty Master Principal Sales Consultant). While I expected to be entertained (and Gobbo’s integrated ERP/HCM/EPM demo was one for the ages), I didn’t expect them to tackle the key question on everyone’s mind: what about security in the Cloud? Mark Hurd did address this in his keynote and he gave a fun fact: if someone finds a security flaw in Oracle’s software on a Tuesday, Oracle will patch in by Wednesday, and it will take an average of 18 months until that security patch gets installed in the majority of their client base. Rondy addressed it even more directly: if you think hackers haven’t infiltrated your network, you’re sticking your head in the sand. Without going into all of Rondy’s points, his basic argument was that Oracle is better at running a data center than any of their customers out there. He pointed out that Oracle now has 90 data centers around the world and that security overrides everything else they do. He also said, “security is in our DNA” which is almost the exact opposite of “Danger is my middle name,” but while Rondy’s line won’t be getting him any dates, it should make the customer base feel a lot safer about letting Oracle host their Cloud applications. The reason I picked the quote above is because it really sums up the whole theme of the conference: the Cloud is not doing battle with on-premises. The Cloud did that battle, won with a single sucker punch while on-prem was thinking it had it made, and Cloud currently dancing on the still unconscious body of on-prem who right now is having a bad nightmare involving losing its Blackberry while walking from Blockbuster to RadioShack. David is right: the Cloud is coming to every company and the only question is when you’ll start that journey. So, what can we do about all these changes coming to Finance? And for that matter, all the changes coming to every facet of every industry in every country on Earth? Rod Johnson (which he assures me is his not his “stage” name) said it best: don’t fight the change but rather embrace it and make sure you can change faster than everyone else. "Change comes to those who wait, but it’s the ones bringing the change who are in control." To read more about some of those disruptive changes coming to the world of Finance, download the white paper I mentioned above. Deliver Reports to Document Cloud Services! Errors occurred. Send /u01/onecommand/linux-x64/WorkDir/Diag-170427_181710.zip to Oracle to receive assistance. Failed to create voting files on disk group RECOC1. Change to configuration failed, but was successfully rolled back. Died at /u01/app/12.1.0.2/grid/crs/install/crsinstall.pm line 2068. So we can see the issue here. We can look at the above trace file also for more detail. Now to why did this happen ? The RECOC1 is a HIGH redundancy disk group which means that if we want to place Voting files there, it should have at least 5 failure groups. In this configuration there are only 3 cells and that doesn’t meet the minimum failure groups condition (1 cell = 1 failgroup in Exadata). Now to how did it happen ? This one was an Exadata X3 half rack and we planned to deploy it (for testing purpose) as 2 quarter racks : 1st cluster with db1, db2 + cell1, cell2, cell3 and 2nd cluster with db3, db4 + cell4, cell5, cell6, cell7. All the disk groups to be in High redundancy. Before a certain 12.x Exadata software version it was not even possible to have all disk groups in High redundancy in a quarter rack as to have Voting disk in a High redundancy disk group you need to have a minimum of 5 failure groups (as mentioned above). In a quarter rack you have only 3 fail groups. With a certain 12.x Exadata software version a new feature quorum disks was introduced which made is possible to have that configuration. Read this link for more details. Basically we take a slice of disk from each DB node and add it to the disk group where you want to have the Voting file. 3 cells + 2 disks from DB nodes makes it 5 so all is good. Now while starting with the deployment we noticed that db node1 was having some hardware issues. As we needed the machine for testing so we decided to build the first cluster with 1 db node only. So the final configuration of 1st cluster had 1 db node + 3 cells. We imported the XML back in OEDA, modified the cluster 1 configuration to 1 db node and generated the configuration files. That is where the problem started. The RECO disk group still was High redundancy but as we had only 1 db node at this stage so the configuration was not even a candidate for quorum disks. Hence the above error. Changing DBFS_DG to Normal redundancy fixed the issue as when DBFS_DG is Normal redundancy, OneCommand will place the Voting files there. Ideally it shouldn’t happened as OEDA shouldn’t allow a configuration that is not doable. The case here is that as originally the configuration was having 2 db nodes + 3 cells so High redundancy for all disk groups was allowed in OEDA. While modifying the configuration when one db node was removed from the cluster, OEDA probably didn’t run the redundancy check on disk groups and it allowed the go past that screen. If you try to create a new configuration with 1 db node + 3 cells, it will not allow you to choose High redundancy for all disk groups. DBFS will remain in Normal redundancy. You can’t change that. Breaking News! Dodeca Spreadsheet Management System Certified on Oracle Analytics Cloud! Now that the Oracle Analytics Cloud, or "OAC", has been released, we had to get serious about our work with one of the Oracle Analytics Cloud components, the Essbase Cloud Service, or "EssCS" for short. You would think that we should have been working hard on EssCS for quite some time, but we had been assured by Oracle product management that the Essbase Java API would be available in EssCS. Of course, Dodeca was built using the Essbase Java API and thus we expected that support for EssCS would be very easy. We got access to a production version of the EssCS last week and started our work. As promised by product management, the Essbase Java API is available in EssCS and, believe it or not, we did not need to change a single line of source code in order to support the Essbase Cloud. We did, however, have to update our build processes to use Java 8 instead of the decrepit Java 6 used in Essbase 11.x. In summary, it was trivial to test Dodeca using EssCS. Every single Essbase functionality that we use in the product, from data grid operations to metadata operations and even report scripts, worked exactly the same as it does against an on premise Essbase cube. Based on our testing, we are certifying the Dodeca Spreadsheet Management System to work on the Oracle Analytics Cloud. We have a number of innovations we plan to introduce in the near future aimed to improve the Essbase Cloud experience, so stay tuned. If you are planning to come to Kscope17 in San Antonio, plan to attend the Dodeca Symposium and you may just be the first to see of these cool new things! 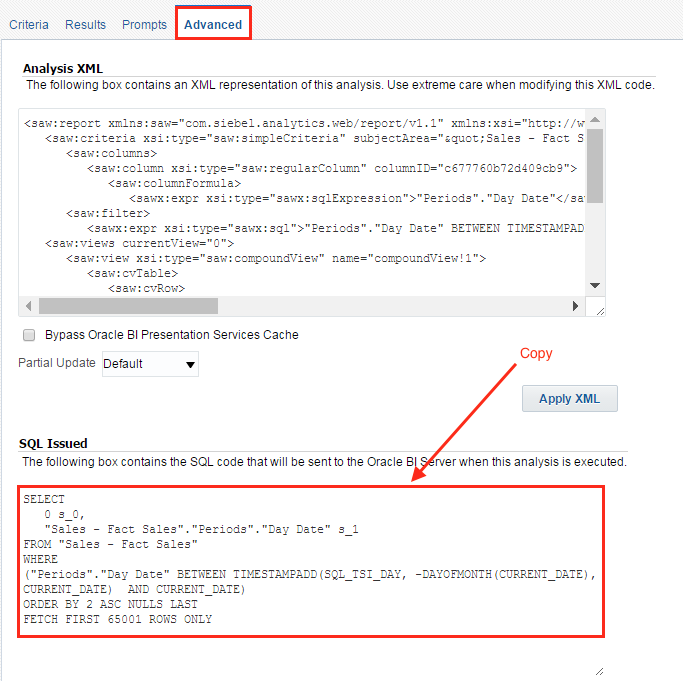 I recently wrote a blog post about Oracle's Analytic Views and how those can be used in order to provide a simple SQL interface to end users with data stored in a relational database. In today's post I'm expanding a little bit on my horizons by looking at how to effectively query data in Hadoop using SQL. The SQL-on-Hadoop interface is key for many organizations - it allows querying the Big Data world using existing tools (like OBIEE,Tableau, DVD) and skills (SQL). Analytic Views, together with Oracle's Big Data SQL provide what we are looking for and have the benefit of unifying the data dictionary and the SQL dialect in use. It should be noted that Oracle Big Data SQL is licensed separately on top of the database and it's available for Exadata machines only. Nowadays there is a multitude of open-source projects covering the SQL-on-Hadoop problem. 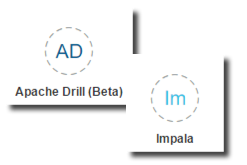 In this post I'll look in detail at two of the most relevant: Cloudera Impala and Apache Drill. We'll see details of each technology, define the similarities, and spot the differences. Finally we'll show that Drill is most suited for exploration with tools like Oracle Data Visualization or Tableau while Impala fits in the explanation area with tools like OBIEE. The first point inspired Apache Parquet, the columnar storage format available in Hadoop. The second point provides the basis for both Impala and Drill. We started blogging about Impala a while ago, as soon as it was officially supported by OBIEE, testing it for reporting on top of big data Hadoop platforms. However, we never went into the details of the tool, which is the purpose of the current post. provides high-performance, low-latency SQL queries on data stored in popular Apache Hadoop file formats. Data stored in popular Apache Hadoop file formats: Impala uses the Hive metastore database. Databases and tables are shared between both components. The list of supported file formats include Parquet, Avro, simple Text and SequenceFile amongst others. Choosing the right file format and the compression codec can have enormous impact on performance. Impala also supports, since CDH 5.8 / Impala 2.6, Amazon S3 filesystem for both writing and reading operations. One of the performance improvements is related to "Streaming intermediate results": Impala works in memory as much as possible, writing on disk only if the data size is too big to fit in memory; as we'll see later this is called optimistic and pipelined query execution. This has immediate benefits compared to standard MapReduce jobs, which for reliability reasons always writes intermediate results to disk. As per this Cloudera blog, the usage of Impala in combination with Parquet data format is able to achieve the performance benefits explained in the Dremel paper. Impala runs a daemon, called impalad on each Datanode (a node storing data in the Hadoop cluster). The query can be submitted to any daemon in the cluster which will act as coordinator node for the query. Impala daemons are always connected to the statestore, which is a process keeping a central inventory of all available daemons and related health and pushes back the information to all daemons. A third component called catalog service checks for metadata changes driven by Impala SQL in order to invalidate related cache entries. Metadata are cached in Impala for performance reasons: accessing metadata from the cache is much faster than checking against the Hive metastore. The catalog service process is in charge of keeping Impala's metadata cache in sync with the Hive metastore. Once the query is received, the coordinator verifies if the query is valid against the Hive metastore, then information about data location is retrieved from the Namenode (the node in charge of storing the list of blocks and related location in the datanodes), it fragments the query and distribute the fragments to other impalad daemons to execute the query. All the daemons read the needed data blocks, process the query, and stream partial result to the coordinator (avoiding the write to disk), which collects all the results and delivers it back to the requester. The result is returned as soon as it's available: certain SQL operations like aggregations or order by require all the input to be available before Impala can return the end result, while others, like a select of pre-existing columns without a order by can be returned with only partial results. Defining Apache Drill as SQL-on-Hadoop is limiting: also inspired by Google's Dremel is a distributed datasource agnostic query engine. The datasource agnostic part is very relevant: Drill is not closely coupled with Hadoop, in fact it can query a variety of sources like MongoDB, Azure Blob Storage, or Google Cloud Storage amongst others. One of the most important features is that data can be queried schema-free: there is no need of defining the data structure or schema upfront - users can simply point the query to a file directory, MongoDB collection or Amazon S3 bucket and Drill will take care of the rest. For more details, check our overview of the tool. One of Apache Drill's objectives is cutting down the data modeling and transformation effort providing a zero-day analysis as explained in this MapR video. Distributed engine: Drill processes, called Drillbits, can be installed in many nodes and are the execution engine of the query. Nodes can be added/reduced manually to adjust the performances. Queries can be sent to any Drillbit in the cluster that will act as Foreman for the query. Columnar execution: Drill is optimized for columnar storage (e.g. Parquet) and execution using the hierarchical and columnar in-memory data model. Vectorization: Drill take advantage of the modern CPU's design - operating on record batches rather than iterating on single values. 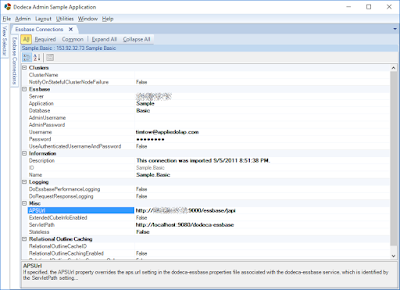 Runtime compilation: Compiled code is faster than interpreted code and is generated ad-hoc for each query. Optimistic and pipelined query execution: Drill assumes that none of the processes will fail and thus does all the pipeline operation in memory rather than writing to disk - writing on disk only when memory isn't sufficient. Like Impala's impalad, Drill's main component is the Drillbit: a process running on each active Drill node that is capable of coordinating, planning, executing and distributing queries. Installing Drillbit on all of Hadoop's data nodes is not compulsory, however if done gives Drill the ability to achieve the data locality: execute the queries where the data resides without the need of moving it via network. As we saw above, Drill and Impala have a similar structure - both take advantage of always on daemons (faster compared to the start of a MapReduce job) and assume an optimistic query execution passing results in cache. The code compilation and the distributed engine are also common to both, which are optimized for columnar storage types like Parquet. Drill usually doesn't require a metadata definition done upfront, while for Impala, a view or external table has to be declared before querying. Following this point there is no concept of a central and persistent metastore, and there is no metadata repository to manage just for Drill. In OBIEE's world, both Impala and Drill are supported data sources. The same applies to Data Visualization Desktop. The aim of this article isn't a performance-wise comparison since those depends on a huge amount of factors including data types, file format, configurations, and query types. A comparison dated back in 2015 can be found here. Please be aware that there are newer versions of the tools since this comparison, which bring a lot of changes and improvements for both projects in terms of performance. Impala and Drill share a similar structure - both inspired by Google's Dremel - relying on always active daemons deployed on cluster nodes to provide the best query performances on top of Big Data data structures. So which one to choose and when? As described, the capability of Apache Drill to query a raw data-source without requiring an upfront metadata definition makes the tool perfect for insights discovery on top of raw data. The capacity of joining data coming from one or more storage plugins in a unique query makes the mash-up of disparate data sources easy and immediate. Data science and prototyping before the design of a reporting schema are perfect use cases of Drill. However, as part of the discovery phase, a metadata definition layer is usually added on top of the data sources. This makes Impala a good candidate for reporting queries. Summarizing, if all the data points are already modeled in the Hive metastore, then Impala is your perfect choice. If instead, you need a mashup with external sources, or need work directly with raw data formats (e.g. JSON), then Drill's auto-exploration and openness capabilities are what you're looking for. Even though both tools are fully compatible with Oracle BIEE and Data Visualization (DV), due to Drill's data exploration nature, it could be considered more in line with DV use cases, while Impala is more suitable for standard reporting like OBIEE. The decision on tooling highly depends on the specific use case - source data types, file formats and configurations have deep impact on the agility of the business analytics process and query performance. If you want to know more about Apache Drill, Impala and the use cases we have experienced, don't hesitate to contact us! I wasn’t able to make sense of it for quite some time until a colleague pointed out that the reverse lookup entries should be done for FQDN only. As it is clear in the above message reverse lookup of the IP 192.168.99.102 returns dm01dbadm02 instead of dm01dbadm02.example.com. Fixing this in DNS resolved the issue. Actually the customer had done reverse lookup entries for both the hostname and FQDN. As the DNS can return the results in any order, so the error message was bit random. Whenever the the hostname was returned first, Step 1 gave an error. But when the FQDN was the first thing returned, there was no error in Step 1 for that IP. Rittman Mead has the capability to engineer any solution desired, and in many cases, has already developed a solution. Many of our accelerators currently offered, such as Chit Chat or User Engagement, grew out of numerous requests for these features. 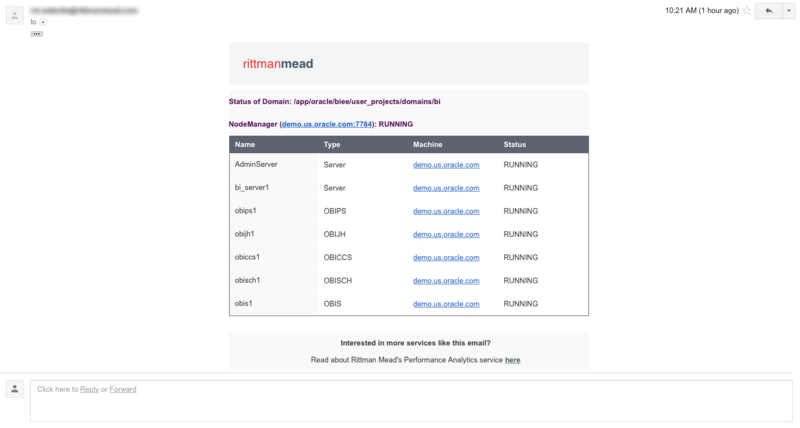 One of the more common requests we hear at Rittman Mead is for BI Administrators to receive notifications for the status of their OBIEE components. They want to be notified of the status of the system components throughout the day in a convenient manner, so any failures are recognized quickly. This particular feature can easily be implemented with Rittman Mead's Performance Analytics service. However, Rittman Mead would like to publicly provide this capability independent of our accelerator. We have developed a small Python script to provide this functionality, and we would like to give this script to the community. The provided script is available free of charge, and available under the MIT license. It has been tested on both OBIEE 11G and 12C environments, as well as on Windows and Linux operating systems. The rest of this blog will detail, at a high level, how the script works, and how to configure it correctly. The script is available through our public Github repository here. First, let's clarify how we will gather the status of the components in the first place. Thankfully, OBIEE includes some scripts to display this information on both Linux and Windows. 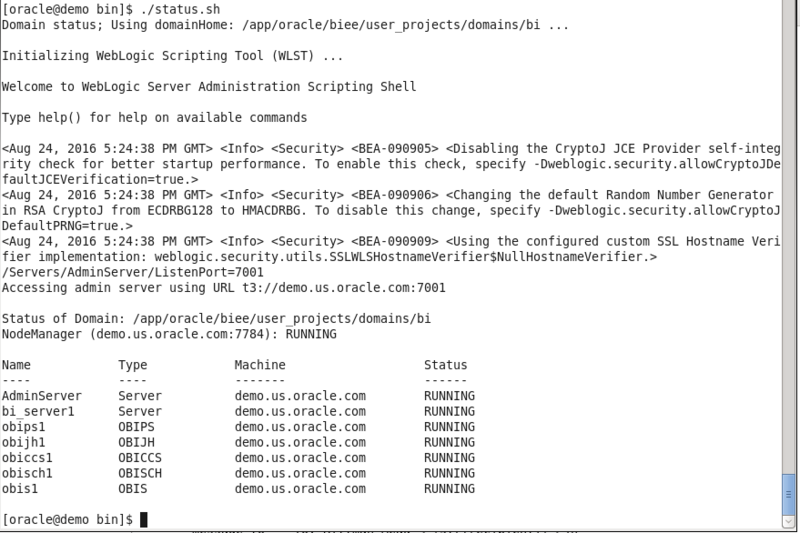 In 12C, the script is status.sh/status.cmd, and in 11G the primary command is opmnctl status. The output includes some extra information we don't require, but we can ignore it for now. With some programming knowledge, we can trim what we don't need, organize it into a nice table, and then send the output to nearly anywhere desired. For portability and stability, I will use Python to organize the message contents and I will also use email as the channel of communication. If we are only concerned with notifying administrators of the current status, one of the better avenues to send this data is through email. An email destination will allow users to be able to receive the status of the components almost instantaneously, and be able to take the appropriate action as soon as possible. Now we have something nice we can send BI Administrators to show the status of the components. The sender and username fields should both be the user you are logging in as on the SMTP server to send the email. If you want the email address shown on a message to be different than the user configured on the SMTP server, then these can be set separately. The password field should be the password for the user being configured on the SMTP server. The recipient field should be the address of the user who will be receiving the emails. For simple management, this should be a single user, who should then be configured to forward all incoming status emails to the responsible parties. This will allow easier maintenance, since modifying the list of users can take place in the email configuration, rather than the script configuration. In this example, I am just sending the emails to my Rittman Mead email address. The SMTP settings should also be updated to reflect the SMTP server being utilized. If you are using Gmail as the SMTP server, then the configuration shown should work without modifications. Finally, the python script requires the absolute path to the status command to execute to produce the output (the opmnctl or status commands). Environment variables may not be taken into consideration by this script, so it's best to not use a variable in this path. NOTE: If the \ character is in the path, then you MUST use \\ instead. This is especially true on Windows environments. If this change is required but omitted, the script will not function properly. Additionally, if you don't care about the HTML output (or if it doesn't render nicely in your email client), then it can be disabled by setting the value of render_html to False. If, for some reason, the nice HTML fails to render, then the email will just send the plain text output, instead of failing to deliver an email at all. If everything worked correctly, then you should have received an email with the status of the components. If you do not receive an email, then you should check both the configuration settings, and the internet connection of the machine (firewalls included). The script will also generate output that should assist you in troubleshooting the cause of the problem. The solution provided, while useful, is not perfect. What if you want to send this information to a destination other than an email address, such as a ticketing system like Atlassian JIRA? Or what if you want notifications based on other situations, such as slow running reports, or high CPU usage? 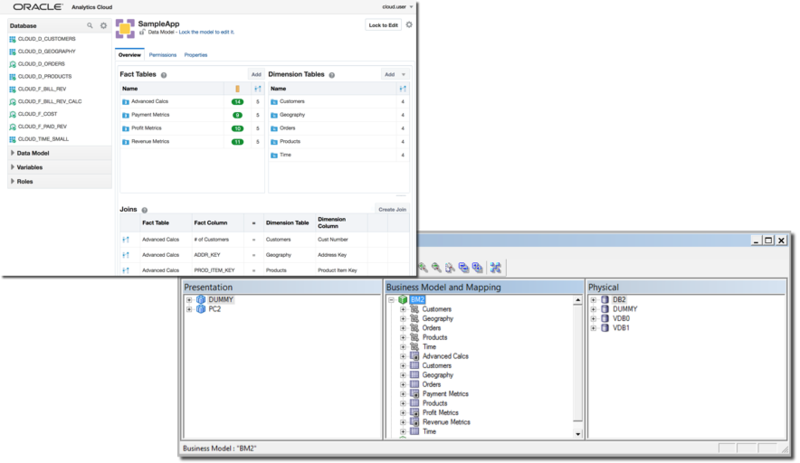 There may be many situations in which you would want one, or several, employees to receive different notifications based on events or circumstances that occur in your OBIEE environment. The script in this blog post only provides one of these notifications, but implementing many more will quickly become burdensome. As part of Rittman Mead's Performance Analytics offering, we include custom software and code to fulfill this requirement. In addition to providing dashboards to explore the performance of your OBIEE systems, Performance Analytics can be configured to distribute alerts, based on any quantifiable condition, to any number of external systems. The full Performance Analytics suite can not only alert users of down system components, but of any number of conditions that may occur in your BI environment. If you have questions about this script, Performance Analytics, or anything else Contact Us here. To find out more about Performance Analytics, contact us, visit the product page here, or read some of the fantastic blogs from Robin Moffatt. This is their lucky day: Oracle officially launched Oracle Analytics Cloud (OAC), a new PaaS (Platform as a Service) providing a complete and elastic Business Intelligence platform in the cloud, customizable and managed by you but all on the Oracle Cloud! If you haven't been on a remote island you may have noticed that in recent years Oracle's main focus has been around the Cloud. Several products have been launched covering a vast spectrum of functionalities: Data Management, Application Development, Business Analytics and Security are only some of the areas covered by the Software/Platform/Infrastructure as a Service offering. 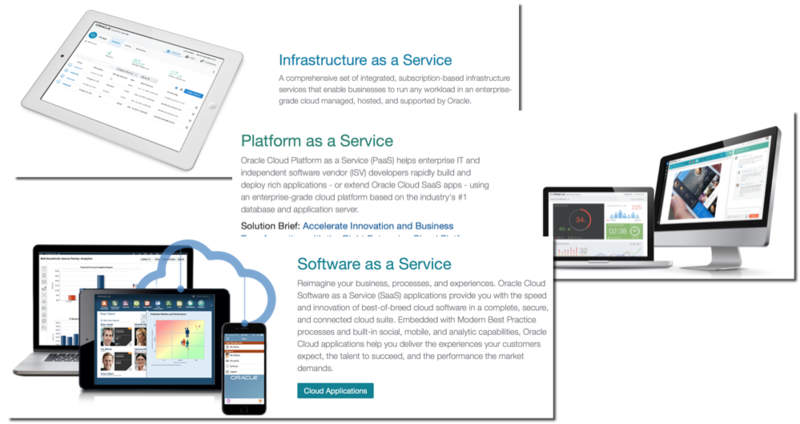 In the Business Analytics area, we at Rittman Mead started thinking long time ago on how to host Oracle's BI on-premises (OBIEE) in the Cloud and worked closely with Oracle since the beta phase of their first PaaS product: BI Cloud Service (BICS). Effectively we put our hands on all the cloud products in the BA family like Big Data Discovery (both on premises and cloud), Data Visualization Cloud Service, Big Data Preparation Service. Until few weeks ago Oracle's main Business Analytics cloud products were BI Cloud Service (BICS) and Data Visualization Cloud Service (DVCS). As mentioned in our blog both tools aimed initially at departmental use-cases: the simplicity of the data model interface and the lack of admin configuration options stopped them from being a compelling story for hosting a full enterprise Business Intelligence solution. New features like BICS Data Sync, Remote Data Connector and RPD lift and shift addressed almost all the limitations but the lack of detailed admin/maintenance capabilities represent a stopper for moving complex environments in the cloud. 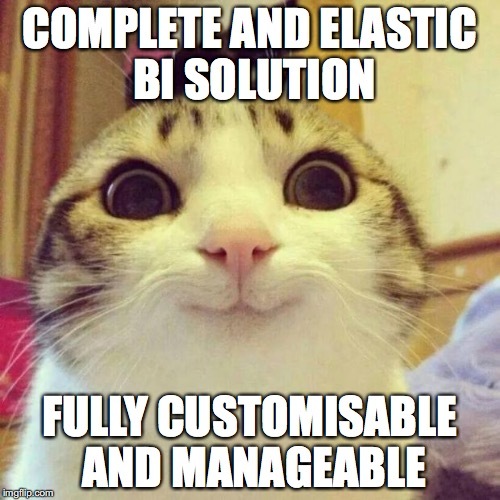 Still BICS and DVCS are perfect for their aim: business users analysing sets of data without needing to wait the IT to provision a server or to care about upfront licensing costs. Complete functionality: most of the tools, procedures and options provided on-premises are now available in OAC. Combining all the offering of BICS, DV, BIEE and Essbase: OAC includes the features of Oracle's top BI products. Easily Scalable: do you want to expand your BI solution to the double of the users without loosing performances? Just buy some more horsepower! Fully Customer Managed: Oracle provides the automation to backup and patch but the customer decides when to run them. So what's the difference between Oracle Analytics Cloud and the "old" DVCS and BICS? How is OACS going to change Oracle's BI offer in the cloud? The great deal of using OACS is control: BICS/DVC limiting factors around admin options and development are solved providing a tool capable of hosting a full enterprise BI solution. Even if the platform is managed by Oracle SSH access is provided meaning that instance configurations can be changed. No more upfront server sizing decisions, now the size of the instance is decided during creation time and can be changed later in the process if the demand changes. The REST-APIs will enable the scripting of the full lifecycle of the instance, providing a way to automate the BI enterprise workflow even in complex environments where concurrent development is needed. Patching and Backups are not a problem anymore with the automated processes provided. Direct RPD online editing is available with the Admin tool. The old BICS Data Modeler is still there for simple models, but Admin Tool can be used in case of complex RPDs. The front-end is like the BICS and OBIEE 12c one, some new visualization have been added to Visual Analyzer in line with the new additions to Data Visualization Desktop: Parallel Coordinates, Chord, Network, Sankey diagrams are now available. 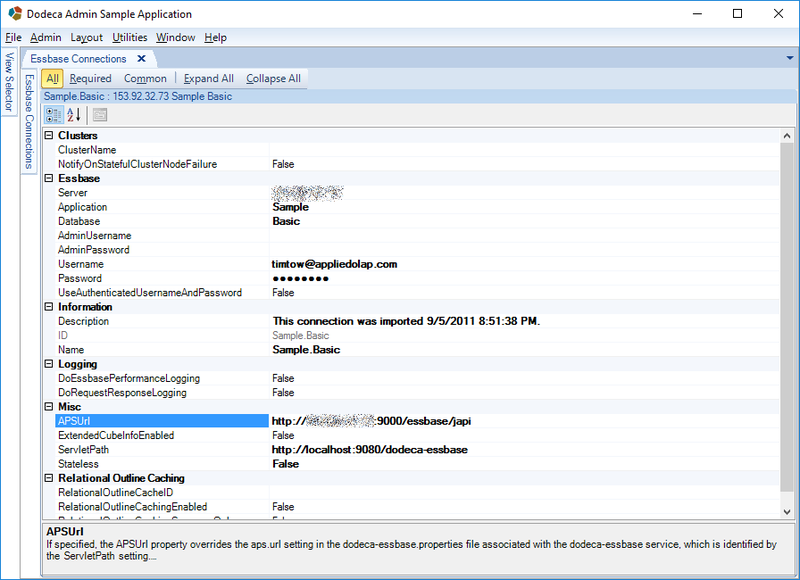 A new console is now available in Visual Analyzer allowing settings like Mail or Deliveries that before were only accessible via Weblogic Console, Enterprise Manager or config files. Finally Essbase is now available in the cloud too with a new web interface! Summarizing, if you wanted to go Cloud, but were worried about missing options, now Oracle Analytics Cloud provides all you need to host a full Enterprise BI solution. In the next few days I'll be analysing various aspects of Oracle Analytics Cloud Suite, so keep in touch! Metadata modeling can now be done directly in the database using Analytic Views, providing to end users a way of querying database objects without needing a knowledge of joining conditions, aggregation functions or order by clauses. 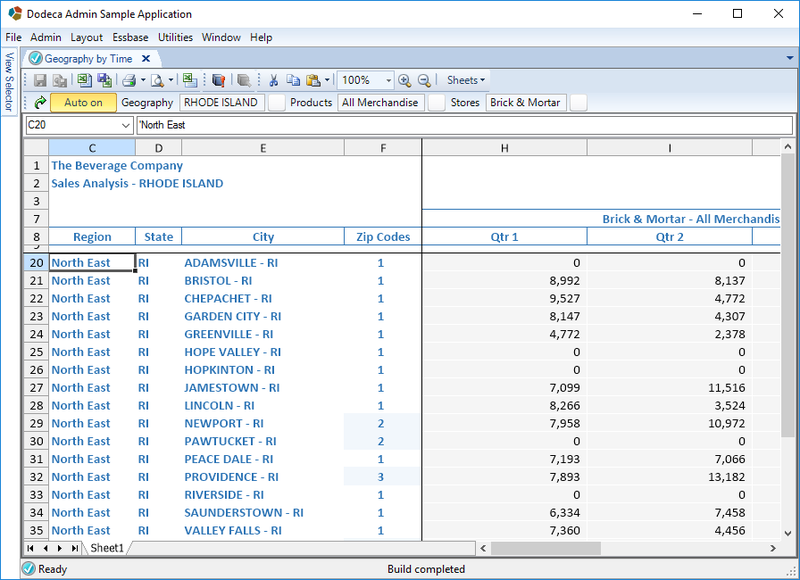 This post will guide you through the creation of an analytic view that replicates a part of a OBIEE's Sampleapp business model. 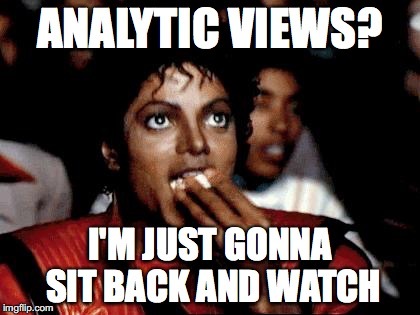 The latest part of the post is dedicated to understanding the usage of analytic views and the benefits for end users especially in cases when self-service BI tools are used. If you are still around and interested in the topic please take a drink and sit comfortably, it will be a good journey. What are then the Analytics Views in detail? How are they going to improve end user's ability in querying data? This allows end users to just pick columns from a Subject Area and display them in the appropriate way without needing to worry about writing SQL or knowing how the data is stored. Moreover definitions are held centrally providing the famous unique source of truth across the entire enterprise. 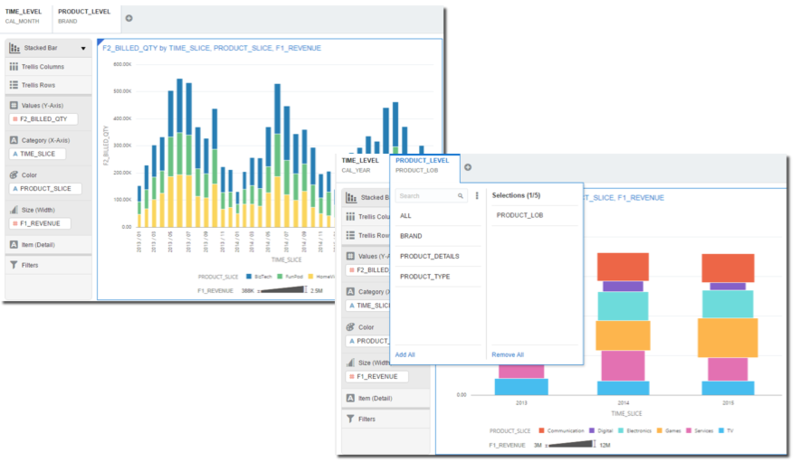 The wave of self-service BI tools like Tableau or Oracle's Data Visualization Desktop provided products capable of querying almost any kind of data sources in a visual and intuitive way directly in the end user hands. An easy and direct access to data is a good thing for end user but, as stated above, requires knowledge of the data model, joins and aggregation methods. The self-service tools can slightly simplify the process by providing some hints based on column names, types or values but the cruel reality is that the end-user has to build the necessary knowledge of the data source before providing correct results. This is why we've seen several times self-service BI tools being "attached" to OBIEE: get corporate official data from the unique source of truth and mash them up with information coming from external sources like personal Excel files or output of Big Data processes. 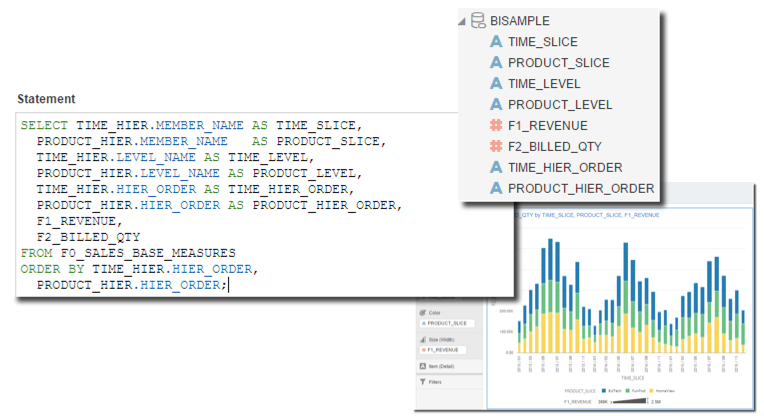 Analytic Views (AV) take OBIEE's metadata modeling concept and move it at database level providing a way of organizing data in a dimensional model so it can be queried with simpler SQL statements. 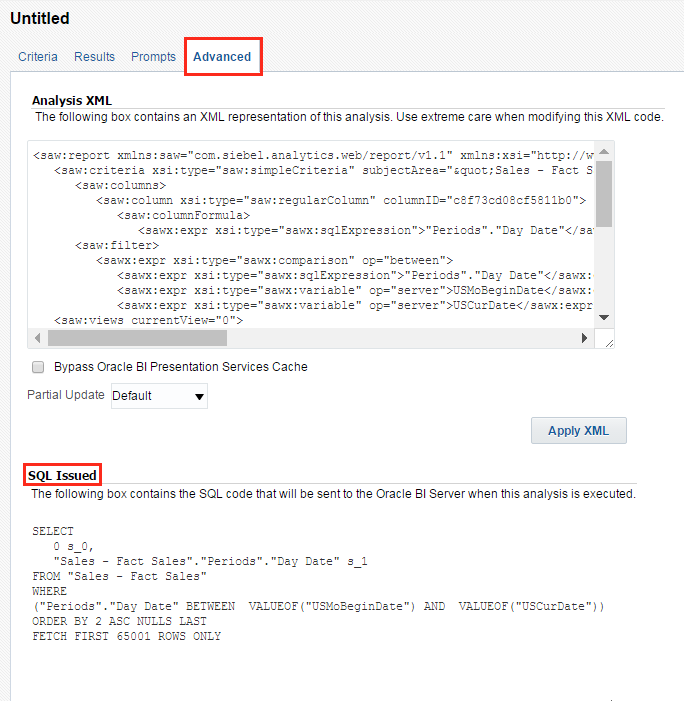 Analytics views are created with a CREATE ANALYTIC VIEW statement, some privileges need to be granted to the creating user, you can find the full list in Oracle's documentation. 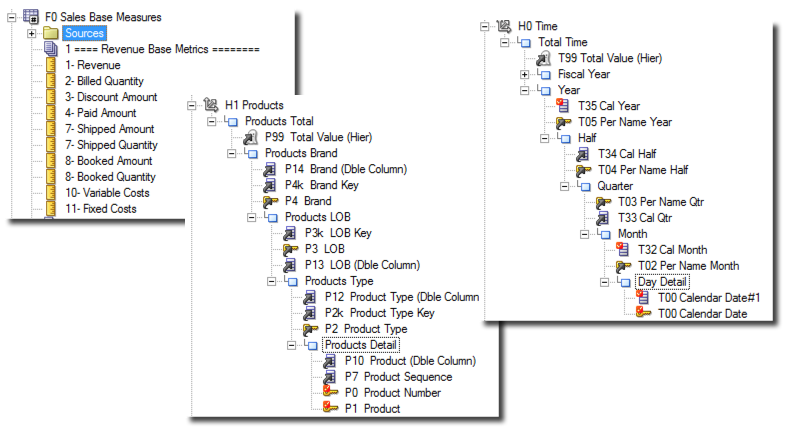 Attribute dimensions: organising table/view columns into attributes and levels. Hierarchies: defining hierarchical relationships on top of an attribute dimension object. Analytic view objects: defining fact data referencing both fact tables and hierarchies. With all the above high level concepts in mind it's now time to try how Analytical Views could be used in a reporting environment. Once the database is created it's time to set the goal: I'll try to recreate a piece of the Oracle's Sampleapp RPD model in the database using Analytic Views. In this blog post I'll look in the 01 - Sample App business model and specifically I'll try to replicate the logic behind Time, Product and the F0 Sales Base Measures using Analytic Views. The Sampleapp's D1 - Products (Level Based Hierarchy) is based on two logical table sources: SAMP_PRODUCTS_D providing product name, description, LOB and Brand and the SAMP_PROD_IMG_D containing product images. For the purpose of this test we'll keep our focus on SAMP_PRODUCTS_D only. The physical mapping of Logical columns is shown in the image below. The first piece we're going to build is the attribute dimension, where we'll be defining attributes and levels. The mappings in above image can "easily" be translated into an attributes with the following SQL. CREATE OR REPLACE ATTRIBUTE DIMENSION: we are currently defining a dimension, the attributes and levels. USING SAMP_PRODUCTS_D: defines the datasource, in our case the table SAMP_PRODUCTS_D. Only one datasource is allowed per dimension. 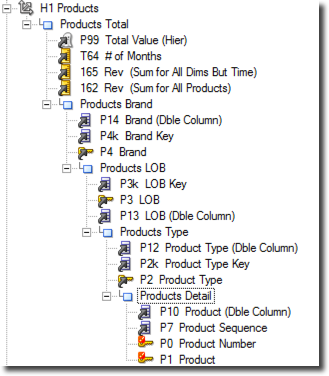 There is an additional DETERMINES line in above sql for each level apart from Brand, this is how we can specify the relationship between level keys. If we take the Product_LOB example, the DETERMINES(P4k_Brand) defines that any LOB in our table automatically determines a Brand (in OBIEE terms that LOB is a child of Brand). A particularity to notice is that the MEMBER_UNIQUE_NAME of Cell Phones is [PRODUCT_TYPE].& which is the concatenation of the LEVEL and the P2K_PRODUCT_TYPE value. One could expect the member unique name being represented as the concatenation of all the preceding hierarchy members, Brand and LOB, and the member key itself in a string like [PRODUCT_TYPE].&&&. 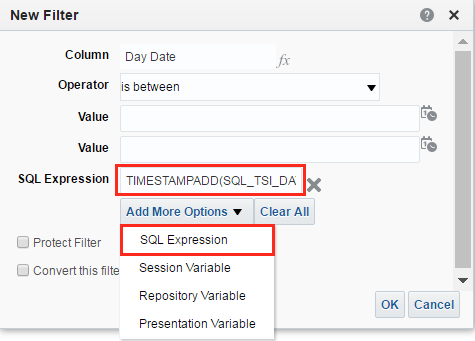 Taking into consideration the additional settings, the Dim Date column mappings in above image can be translated in the following attribute dimension SQL definition. PER_NAME_MONTH: used as "display label"
PER_NAME_MONTH in the YYYY / MM format could be also used for ordering, but most of the times end user requests months in the MM / YYYY format. Being able to set a ordering column different from the member name allows us to properly manage the hierarchy. Time hierarchy follows the same rules as the product one, no additional settings are required. An analytic view specifies the source of its fact data and defines measures that describe calculations or other analytic operations to perform on the data. An analytic view also specifies the attribute dimensions and hierarchies that define the rows of the analytic view. The measures: a set of aggregations based on the predefined columns from the data source. Within analytical views definition a materialized view can be defined in order to store aggregated values. This is a similar to OBIEE's Logical Table Source setting for aggregates. 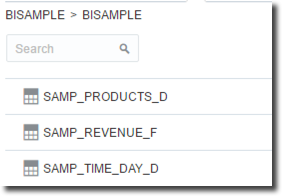 For the purpose of the post I'll use SAMP_REVENUE_F which is one of the sources of F0 Sales Base Measures in Sampleapp. The following image shows the logical column mapping. 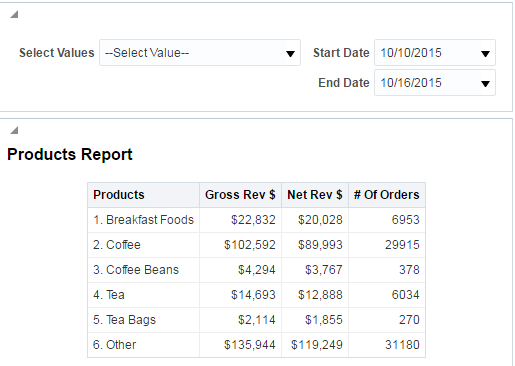 F21_REVENUE_AGO: new metrics can be calculated based on previously defined columns replicating OBIEE functions like time-series. The formula (LAG(F1_REVENUE) OVER (HIERARCHY TIME_HIER OFFSET 1)) calculates the equivalent of the OBIEE's AGO function for each level of the hierarchy. After the analytic view definition, it's time to analyse what benefits end users have when using them. We are going to take a simple example: a query to return the Revenue and Billed Qty per Month and Brand. Even if this is an oversimplification of the analytic view usage you can already spot that some knowledge of the base data structure and SQL language is needed. As you can see, there is a simplification of the SQL statement: no more aggregation, joining conditions and group by predicates are needed. All the end-user has to know is the analytical view name, and the related hierarchies that can be used. without touching granularity, group by and order by statements. At the beginning of my blog post I wrote that Analytic Views could be useful when used in conjunction with self-service BI tools. Let's have a look at how the end user journey is simplified in the case of Oracle's Data Visualization Desktop. Import the fact table and dimensions as separate datasources and join them together in DVD's project. Both options require a SQL and joining conditions knowledge in order to being able to present correct data. Using Analytic Views the process is simplified. We just need to create a new source pointing to the database where the analytic views are sitting. We can however specify with a simple SQL statement all the informations we need like Time and Member Slice, the related levels and the order in hierarchy. You may have noted that I'm not specifying any WHERE clause for level filtering: as end user I want to be able to retrieve all the necessary levels by just changing a filter in my DVD project. After including the above SQL in the datasource definition and amending the measure/attribute definition I can start playing with the analytic view data. I can simply include the dimension's MEMBER_NAME in the graphs together with the measures and add the LEVEL_NAME in the filters. In this way I can change the graph granularity by simply selecting the appropriate LEVEL in the filter selector for all the dimensions available. One particular to notice however is that all the data coming from various columns like date, month and year are "condensed" into a single VARCHAR column. In case of different datatypes (like date in the time dimension) this will prevent a correct usage of some DVD's capabilities like time series or trending functions. However if a particular type of graph is needed for a specific level, either an ad-hoc query or a casting operation can be used. In this blog post we analysed the Analytic Views, a new component in Oracle Database 12.2 and how those can be used to "move" the metadata modeling at DB level to provide an easier query syntax to end-users. Usually metadata modeling is done in reporting tools like OBIEE that offers additional set of features on top of the one included in analytic views. However centralized reporting tools like OBIEE are not present everywhere and, with the wave of self-service BI tools, analytic views represent a perfect method of enabling users not familiar with SQL to simply query their enterprise data. If you are interested in understanding more about analytic views or metadata modeling, don't hesitate to contact us! If you want to improve the SQL skills of your company workforce, check out our recently launched SQL for beginners training! So we can see the problem. lsnodes is not able to list the nodes. Let us try to run that command manually. So looks like it is not able to find this library called libskgxn2.so. If we do a find for this file name we can see that it is present in this directory /usr/cluster/lib/sparcv9/libskgxn2.so . The lsnodes command worked fine after this workaround and installer also shows both the nodes listed. In part two of this blog series, I went over using Repository, System and Presentation Variables to make reports dynamic for any series of time. In part three, I am going to talk about making reports dynamic for periods of time using built in functions within Answers itself. While it's a lot more efficient to create Repository Variables to use in filters and prompts for time dimensions, sometimes it is simply not possible. Perhaps you are a front end developer for OBIEE and have no access to the RPD or the database . Perhaps you have no communication with the person in your organization who handles all of the RPD development and therefore can not submit any change requests. There are several functions and tricks you can use within Answers itself to make reports dynamic and eliminate having to hardcode dates. I have been asked to create a report that is going to reside on a products dashboard. It needs to have the same product grouping as the report I used in part one of this series, needs to contain 'Gross Rev $', 'Net Rev $' and '# of Orders' and have a prompt that can select between the first and current day of the month and every day in-between. The person who requested the report wants the prompt to change dynamically with each month and does not want users to be able to select future dates. In part two, I used a custom SQL statment which used Repository Variables I created to populate all the date values from the first of every month to the current date for Variable Prompts. There is a gap in the data loads for # of Orders in which data does not update until the 2nd or 3rd of each new month. The person who requested the report wanted a summary of the previous months '# of Orders' to be shown until the data is updated for the current month. 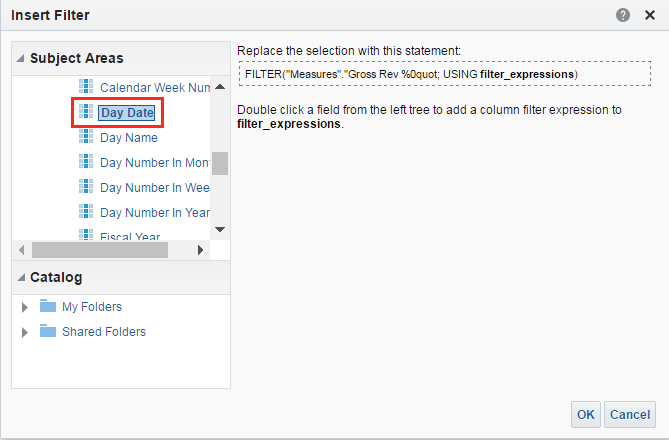 I used a Repository Variable that returned the value of the previous month with the current year and used a CASE statement with along with Filter Expressions to switch between the Filter Expression using the Repository Variable (Prev_Month) if the date was <=2 or if # of Orders is null and the Filter Expression which contained the Start Date and End_Date Presentation Variable placeholders which were defined in my Variable Prompts. In this example, I have to figure out a way to make the report dynamic with only the functions available within Answers. There are two parts to this example. First I need to use a function that will return the previous month's value for the Calendar Year Month column to use with the '# of Orders' column. This will replace the Repository Variable Prev_Month I used in part two of this series. Second I need to write a new SQL statment for the Start Date and End_Date prompts I created in part two and also define a new SQL statment for the default values in those prompts. I am going to start by creating a new statement to return the previous month's value for the Calendar Year Month column. I can use the TIMESTAMPADD function in conjunction with the extraction syntax 'YEAR' and 'MONTH' to return the desired results. Let's take a look at the entire statment and then I will break it down. 1. TIMESTAMPADD - This is what defines that I am going to use addition to return a date by adding or one date to another. 2. SQL_TSI_YEAR and SQL_TSI_MONTH - The first argument in the function. It defines what interval of time the function will work with. 3. -1. This the interval of time that is compared to the third argument. 4. CURRENT_DATE - The third argument in the function. This is what the second argument is compared against. 5. YEAR and MONTH - This is the extraction syntax that will return only the year and the month respectively. Also notice that I have used VARCHAR(6) for the CAST argument. If I use VARCHAR, I can specify the exact number of characters I want returned. Now I need to copy my column formula and paste it into the column formula that I created for '# of Orders' in part two of this series. I am going to replace the Prev_Month Repository Variable with my statement, which will look like this. If I run the report, my results return as expected. Now I need to write a new SQL statement for my Start Date and End Date prompts. In order to do this, I am going to need to use two functions: TIMESTAMPS and CURRENT_DATE. First, lets take a look at the TIMESTAMP function. 3. -DAYOFMONTH(CURRENT_DATE)+1 - This the interval of time that is compared to the third argument. In this case I am taking the negative value of the day of the month, adding 1 and then adding it with current date which always returns 1 or the first day of the month. This is only scratching the surface of what you can do with the TIMESTAMP function. If you would like more information, check out the blog on TIMESTAMPS written by Brian Hall. I am going to add an additional column to the Criteria and use the CURRENT_DATE function in a column formula. Now I am going to click on Results to show the results of the TIMESTAMP function and the CURRRENT_DATE function. From the results you can see that I have both the first day of the month and the current date. 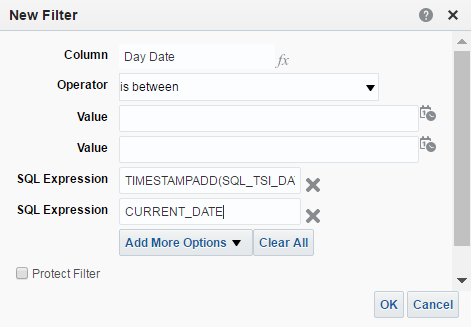 Now I need to convert this into a filter for the Day Date column so that I can get the logical SQL query for my Start Date and End Date prompts. 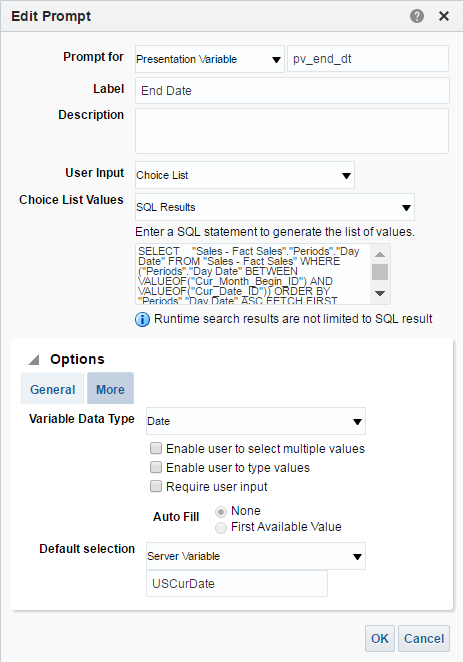 In the New Filter window, I need to change the operator to is between and click on Add More Options to add a SQL Expression. 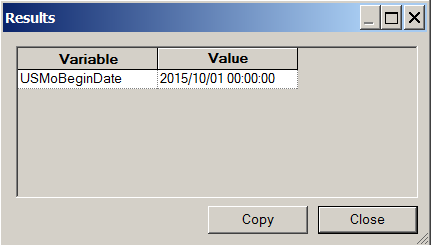 In the SQL Expression box, I need to put the TIMESTAMP function for current date from the previous example. In addition I need to add another SQL Expression for the CURRENT_DATE function. When I return to my Criteria, I can see the filter I created in the Filter window. I can click on Results to run the report. The results for the Day Date column return as expected. 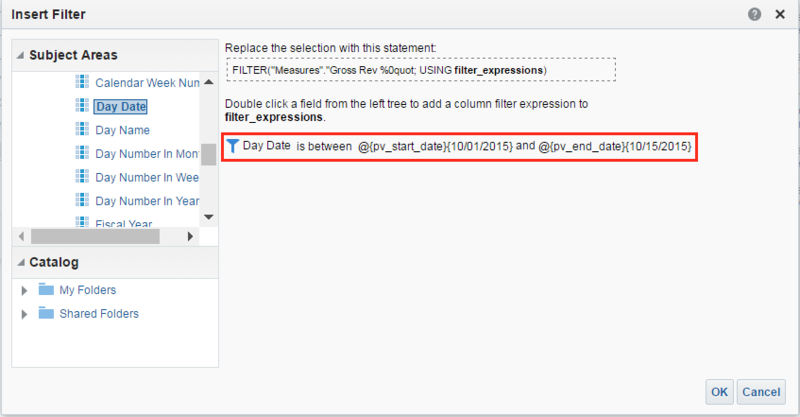 Now I can click on the Advanced tab and copy the logical SQL statement to use for my Start Date and End Date prompts. SELECT "Sales - Fact Sales"."Periods". "Day Date"
FROM "Sales - Fact Sales"
For the default selection, I am using a SQL statment that is selecting the first day of the month using the same TIMESTAMP function used in the above query from my subject area "Sales - Fact Sales". Now I need to change the SQL query for both the Choice List Values and Default Selection for my End Date Variable Prompt. If I go to the Display window, I can view the results of my changes. Notice that the results are exactly the same as the results in part two of this series. I can save the dashboard prompt and go to my dashboard and test the prompt. In part one of this series, we looked at using Bins, CASE statements to create custom grouping for values and switch between those groups and values using Presentation Variables. In part two of this series, we looked at creating Repository Variables to make reports dynamic using those Repository Variables in Variable Prompts and passing them into column formulas using Presentation Variables. In the third and final part of this series, we looked at making reports dynamic by using built in functions within Answers such as TIMESTAMPS and CURRENT_DATE. My hope is that you can take these examples and apply them in your own OBIEE development. If you would like to know more about front end or RPD development, please check out the variety of training courses we offer at Rittman Mead. Until next time. In part one of this blog series, I went over using bins and presentation variables to dynamically create groups and switch between them in a report and on a dashboard. In part two, I am going to talk about making reports dynamic for periods of time using repository, system and presentation variables. Before I dive into an example, there are a couple of things I would like to cover first. Since my database and OBIEE instance are on the same system, sysdate and current_date are the same. When using sysdate or current_date to create repository variables for dates (which I am going to show in an upcoming example), you have to keep something in mind. While the date may match, the time may not. To show an example of this, I am going to join one of my date columns with sysdate. If I run this query, I don't get an error but I get no results. Why? To answer this, I need to write a query to inspect my date column. 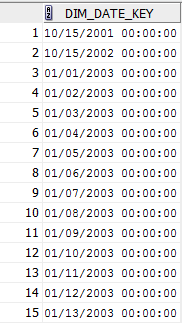 As you can see by the results of my query, the DIM_DATE_KEY column does have the same format as sysdate but all the times are set to 00:00:00 (or midnight). To further demonstrate the difference between my date column and sysdate, I am going to write a new query and use the TRUNC (or TRUNCATE) function. As you can see, the query runs successfully but notice how sysdate and DIM_DATE_KEY still have different times. How is the join possible? Because I used the truncate function in the where clause in my query for sysdate. Without going into too much detail, using truncate on a date function without any formatting (which I will cover later) will set (or truncate) the datetime to the start (or midnight) of the current day. For example, if I run another query that just selects the truncated sysdate from dual, I get this result. Now, lets dive into an example. 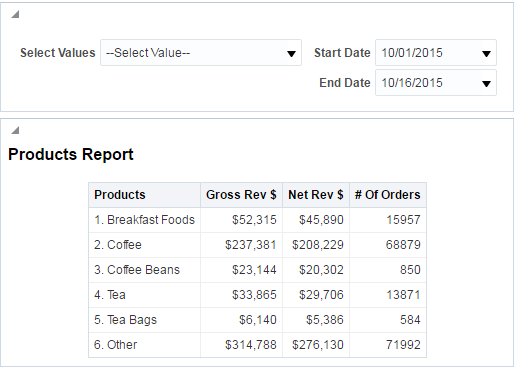 In this example, I have been asked to create a report that is going to reside on a products dashboard. 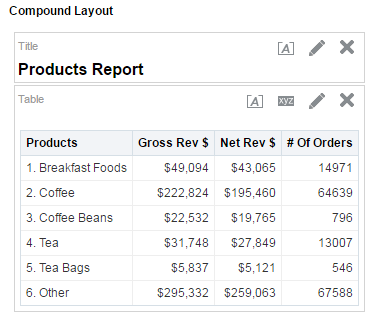 It needs to have the same product grouping as the report I used part one of this series, needs to contain Gross Rev $, Net Rev $ and # of Orders and have a prompt that can select between the first and current day of the month and every day in-between. The person who requested the report wants the prompt to change dynamically with each month and does not want users to be able to select future dates. There are two foreseeable challenges with this report. The first, and probably the most obvious, is how to make the date prompt for the current month and have it change dynamically with each month. The second is how to pass the dates into the report. There is one more challenge that I will have to tackle. There is a gap in the data loads for # of Orders. Data does not update until the 2nd or 3rd of each new month. This wouldn't be a big deal except the person who requested the report wants a summary of the previous months # of Orders to be shown until the data is updated for the current month. Fortunately, by using Repository, System and Presentation Variables, I can accomplish all of the requirements of this report. For this example, I am going to start by creating Repository Variables to use with my date column in order to make the dates dynamic. There are other ways to make dates dynamic using functions within Answers but they are a little bit trickier to use and are less common. I am going to go over some of those functions in part three of this blog series. 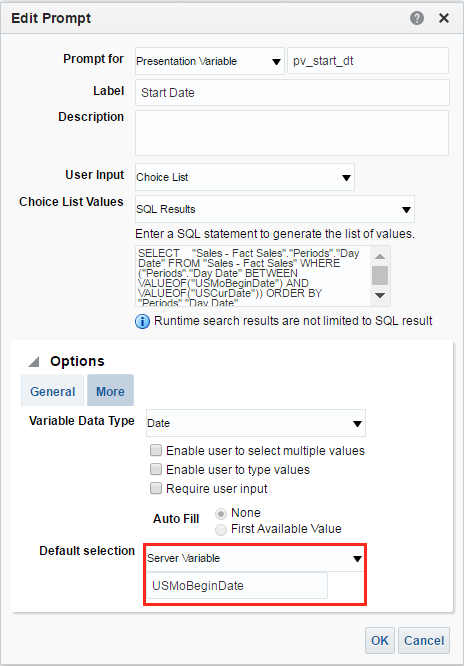 Repository Variables are created using the Admin Tool. By launching the Admin Tool and opening my RPD in online mode (can also be created offline), I can go to Manage > Variables to start creating my first Repository Variable. From the Variable Manager window, I can create a Repository Variable by selecting Action > New > Repository > Variable. I am going to start by creating the Repository Variable for the current date. Since this variable will be dynamic, I need to make sure I select the option 'Dynamic' and I am going to give it the name USCurDate. Once in the Repository Variable Initialization Block screen, I need to give the init block a name, set the schedule for when variable or variables will be refreshed then click Edit Data Source to define the connection pool the init block will use as well as the initialization string (query) the init block will use to populate the Repository Variable. If I click Test, the query will execute and will return a result. Notice how the result is the same as the query I ran using SQL Developer earlier. To break down each part of this query, lets start with the year. In order to use the 'YYYY' format I must first cast sysdate to a character (to_char(sysdate, 'YYYY')). Then I need to cast that result back to and int so that I can multiply by 100. This will give me the result 201500.00. The reason for this is when I add the month number to my yearx100, there will always be a leading 0 for month numbers 1-9. 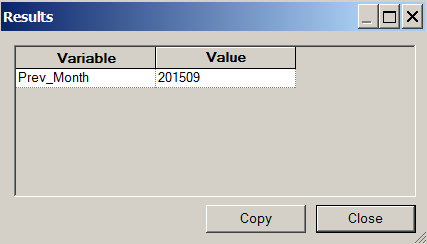 To get the previous month number, I have to first cast sysdate to a character and use the formatting 'MM'. I then have to cast it back to an int and subtract 1 to get the previous month number (to_number(to_char(sysdate, 'MM') -1) then cast the entire statment back to a character type so that it matches the type for the Calendar Year Month column. When I run the query, I get this result. 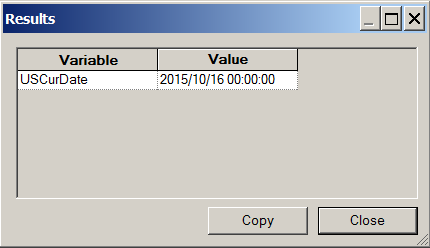 Now that I have my three repository variables (USCurDate, USMoBeginDate and Prev_Month) I can start to create the report. Im going to fast forward a little bit to the part of the report creation process where I will use my Repository Variables I created using the Admin Tool. 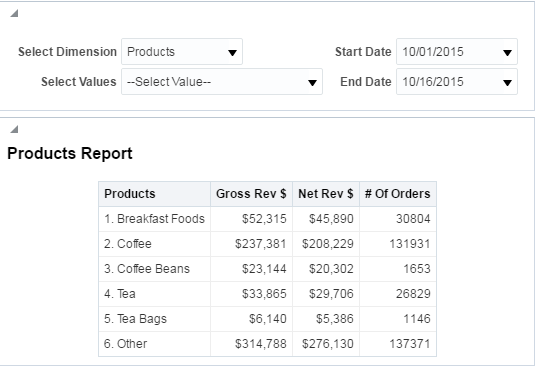 Since I am using virtually the same report as part one of this blog series, please refer back for how to create custom groups using bins and presentation variables and custom value prompts. Because of the delay in the data load for the # of Orders at the beginning of the month, I can not use a global report filter. Instead, I am going to have to use something called a Filter Expression within each measure column formula. 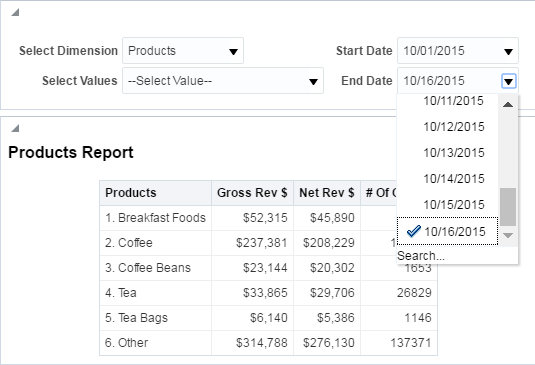 Unlike global report filters, column formula level filter expressions are used when you need to specify a particular constraint within the column formula itself. 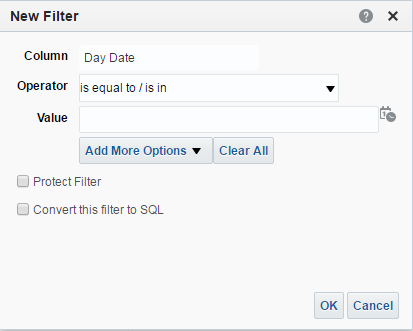 Because the filter is at the column formula level, it is independent of any subsequent column filters. 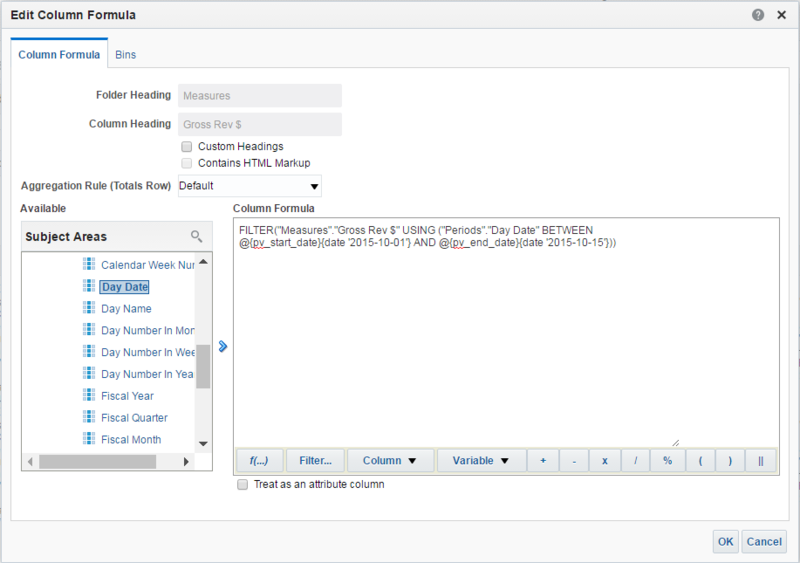 Note: When using a column formula filter for a measure, you can not add a global filter of the same data subject on top of it. 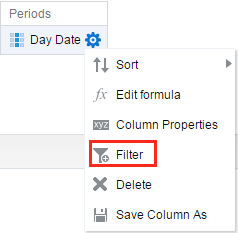 For example, if using a column level filter for a particular Year and Month, I can not add a global filter for a particular year. The two filters contradict each other and the result will be null. 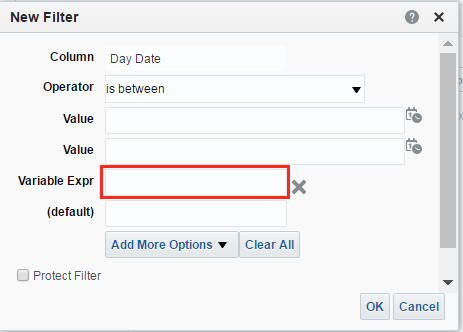 To add a filter in the column formula, go to Edit formula, make sure the column syntax is highlighted and click Filter. From here the Insert Filter window will pop up and I can select the attribute column to filter the measure by. 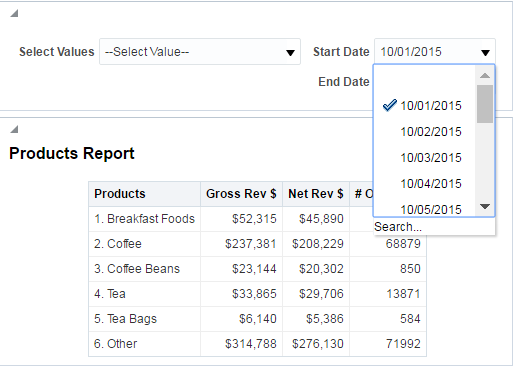 Here, I want to use the column Day Date to filter Gross Rev $ by the day. I can add a column by double clicking it in the the Subject Areas pane. 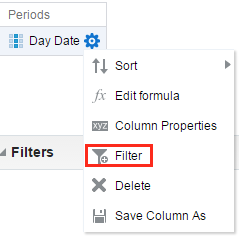 When a column is added, I will be prompted with a New Filter window and from here, everything is exactly the same process as adding a global report filter. Here I need to define the operator as is between since we are dealing with date ranges. I could call my Repository Variables for current_date and first day of the month here but, because the request is for a prompt to select between date ranges, I am going to have to call Presentation Variables and use the prompt to populate the actual values. 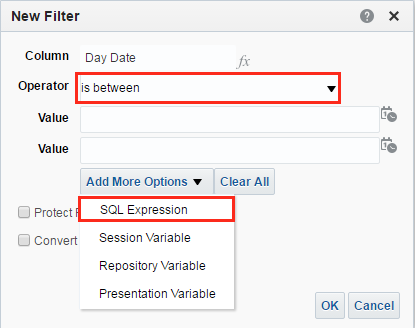 To add Presentation Variables to the filter expression, click Add More Options and select Presentation Variable from the dropdown. When a Presentation Variable is added to the filter, two new text boxes appear. The Variable Expr box is where you define the variable to be used and the (default) box is used to add a default value. The default value is optional but, when defining a Presentation Variable within a filter, you have to specify a default value in order to get any results. 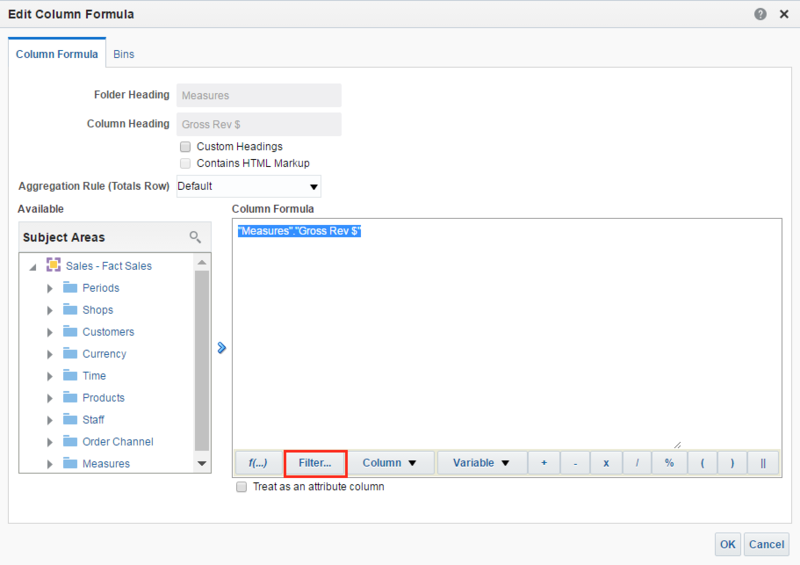 The reason for this is because, when the report is run, the query issued will use the Presentation Variable placeholder that is defined unless a default value is specified. In other words, the default value will always be used unless the Presentation Variable is populated with a value or a list of values. Because I want the users to be able to specify a date range, I need to define two Presentation Variables: one for the start date and one for the end date. 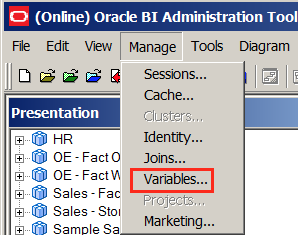 I can add another place for a Presentation Variable by simply clicking Add More Options again and selecting Presentation Variable. Now I need to add both my start and end date Presentation Variables in the Variable Expr boxes. I’m going to call my start date presentation variable pv_start_dt and my end date presentation variable pv_end_dt. 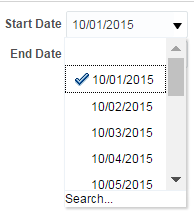 I am also going to specify a default date range from the beginning of the current month (10/01/2015) to yesterday's date (10/15/2015). If I click OK, I will be taken back to the Insert Filter screen where I can see the filter expression previously defined. Clicking OK again will return me to Edit Column Formula which shows the column formula with the filter expression defined in the previous steps. Now I have to do the exact same thing for the Net Rev $ column. 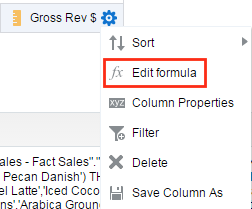 Since the filter expression is identical, I can simply copy and paste the column formula for Gross Rev $ and replace the column name in the expression. Now I need to take care of the # of Orders column. This column is tricky because of the gap between the 1st and the 2nd or 3rd of every month. I could use a filter expression that defaults to the previous month by using the previous month repository variable I created in a previous step, but this alone wouldn’t switch over when the data became available. 1. 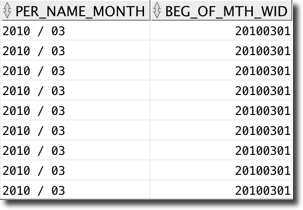 When the day for the current month is less than or equal to 2 OR if # of Orders is null, then filter # of Orders by Calendar Year Month using the value of the Prev_Month Repository Variable. 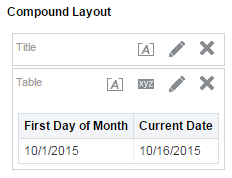 Note that I am using CURRENT_DATE in my column formula. In this case, I am extracting the day number from the current date by using the extract day function (DAY(CURRENT_DATE)). I am going to talk about this in further detail when I talk about using built in functions in Answers to make reports dynamic in part 3 of this series. Now I need to create my dashboard prompt. 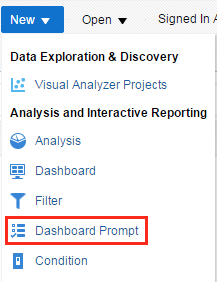 I am going to start by clicking on New > Dashboard Prompt. I need to create two prompts: One for the start date and one for the end date. Because I am using presentation variables as placeholders for the date between values, I have to use a Variable Prompt instead of a Column Prompt. Variable Prompts allow us to define a presentation variable and then define a list of values for the users to select from. 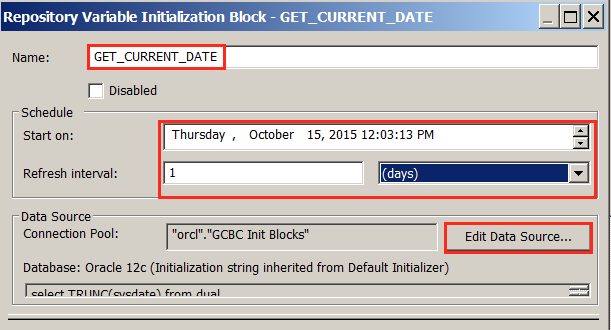 To create a Variable Prompt for Start Date, I can click on the new prompt icon and select Variable Prompt. There a few things I need to do in order to make this prompt function for the report. First, I have to define the same presentation variable name (pv_start_dt) that I used in the filter expressions for the Gross Rev $, Net Rev $ and # of Orders columns. Because this is not a column prompt, I have to manually specify the values I want the user to be able to select from. 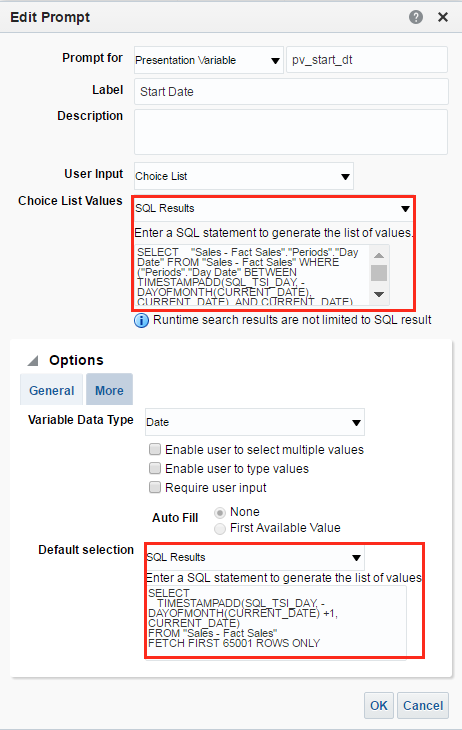 Rather than typing in each value, I can use the SQL Results option from the Choice List Values dropdown and use a SQL statement to select the exact values that I want. This may seem daunting at first but there is a very straightforward way to accomplish this. 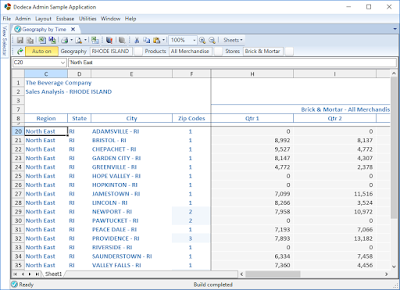 Rather than manually writing out a SQL query, we can make use of the Advanced Tab within a new report. 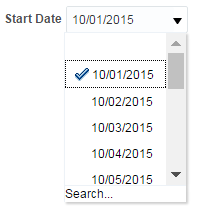 I’m going to start by clicking New > Analysis and selecting the column that I want values for: Day Date. I need to add a filter to Day Date so that it returns only the values I want to user to select from. Now I need to select the operator to be is between and add two Repository Variables that I have set up: one for the first date of the current month and one for the current date of the current month. If I go to results, I can see the data returned with the filter I have specified. Now for the good stuff. 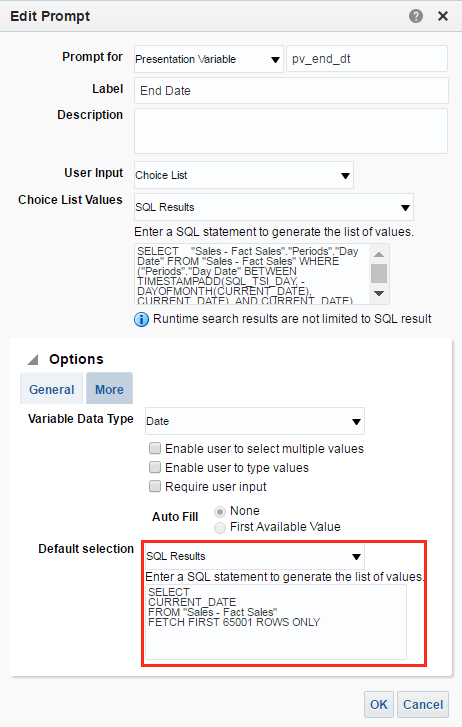 I can navigate to the Advanced Tab and copy the SQL statement used to generate these values and paste them into the SQL Results text box in my prompt. there are numbers and s_# between the SELECT and Day Date column, after the Day Date column and there is also an order by clause that uses a number “2”. Without going into too much detail, this what OBI uses to make the query more efficient when retrieving results from the database. 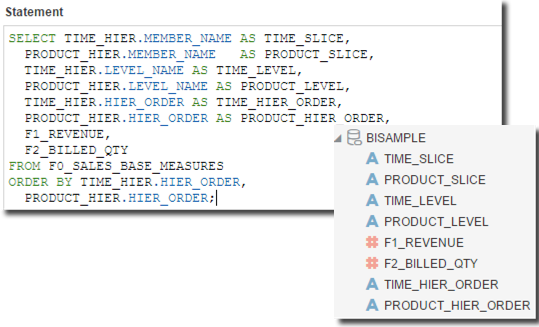 In order to allow the values to populate the prompt, these have to be removed in OBIEE 12c and the “ORDER BY” clause has to be rewritten in order to make it work. "Sales - Fact Sales"."Periods". 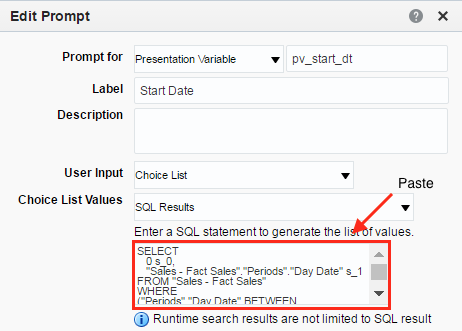 "Day Date"
When populating a prompt using an SQL statement in OBIEE 12c, take out any number and anything that begins with “s” between the SELECT and first column and anything that begins with “s” after any subsequent columns and make sure the “ORDER BY” clause contains the actual column name of the column you want to order by. Note: If you do not require any values to be in order, you can omit the “ORDER BY” clause all together. If I expand Options in the Edit Prompt window, I can add a default selection or a default value that the prompt will start with. I can use the USMoBeginDate here as well so that the prompt always starts with the first date of every month as the start date. Note: You will notice that under Options in the Edit Prompt window there is a Variable Data Type option with a dropdown selector. This can be used if the data type needs to be specified to something other than the default which is ‘text’ or character type. 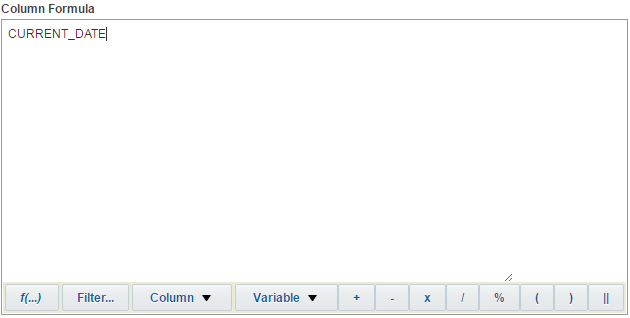 If you are getting an error when running the report that says “Selected value does not match datatype. Expected [this value] but got [this value]” you need to change the Variable Data Type to the datatype of the column you are prompting on. 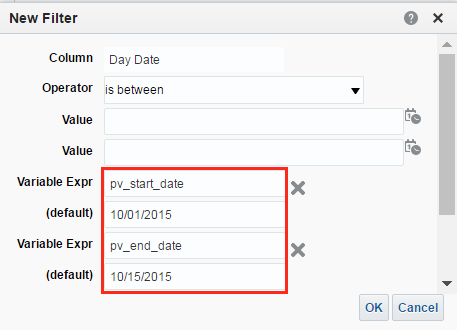 In this example, we are prompting a date datatype so therefore it needs to be set to date. If I click OK, I can check the values in the display window by clicking the dropdown for the Start Date prompt I just created. 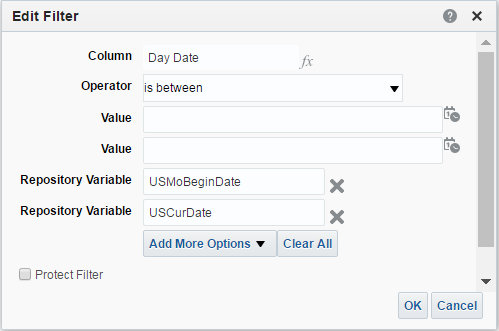 The blue checkmark indicates the value that is selected which, because the first date of every month was set by using the USMoBeginDate Repository Variable as the default value, defaults to the first date of the current month (October, 1st 2015) in this example. Now I need to create another Variable Prompt for the End Date. The SQL statement used for Start Date can be reused for the values as we want the exact same values to be available for selection. 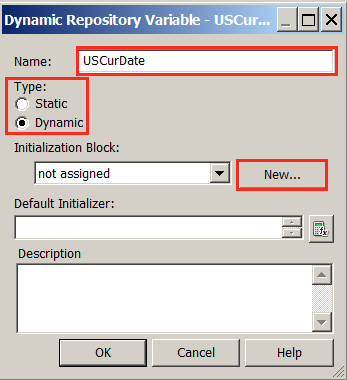 I am going to specify the presentation variable to be named pvenddt, and the default value to be the USCurDate Repository Variable so that the End Date prompt always defaults to the current date. Now all that’s left to do is put the prompt and report on the Dashboard. Here is the result. So that concludes part 2 of Demystification of Variables. Please feel free to ask questions or leave me a comment! In part 3, I am going to talk about using built in front end functions and presentation variables to make reports dynamic for any series of time. Until next time.